Download your free copy of 25 Cool Things to Do with Wine Bottles today! Crafting with wine bottles is a great way to reduce, reuse, and recycle. You can turn empty wine bottles into beautiful vases, candle shelters, decorative centerpieces, and so much more. If you’re really feeling brave and creative, you can cut wine bottle glass with the proper tools and techniques to make small tea light holders, wind chimes, and even cute little charms. In 25 Cool Things to do with Wine Bottles, we’ve gathered 10 great wine bottle crafts that are both decorative and fun. Several of these projects are great for both indoors and out, and also make great gifts if you’re looking for something to give to a party hostess or something to bring to a housewarming party. These Tissue Wine Bottle Vases, for example, are so easy to make and even more fun to show off. With some Mod Podge and a few paper scraps, you can create these beautiful wine bottle vases that are great for holding flowers (both real and fake) or just sitting as they are. Decoupaged wine bottles like this also make beautiful wine bottle centerpieces for weddings, parties, and small social gatherings. 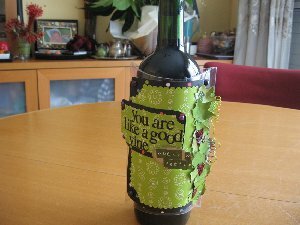 You can find this wine bottle craft, as well as many others, in our free eBook, 25 Cool Things to do With Wine Bottles. If you’re looking unbelievably easy wine bottle craft ideas, we have plenty of those, too! This Hemp Wrapped Wine Bottle can be made in 2 easy steps with less than 5 materials. This is an inexpensive way to add some decorative home accents to any room in your home…and a great way to literally turn trash into treasure! 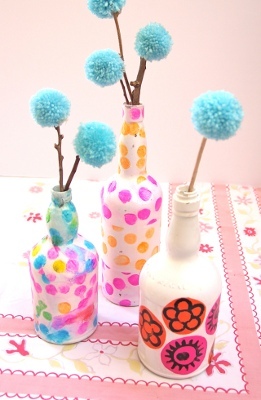 Embellish these bottles with flowers or use colored yarn to create a different look to your old wine bottle. Crafts like these are what make this eBook so great for crafters…there are projects for all skill levels, and you’re bound to find something in this collection of wine bottle projects that suits your style. There are just so many cool things to do with wine bottles…and you won’t believe how easy and fun these projects are! Not only can you make lots of craft projects with wine bottles, but you can also use leftover corks to create cute party favors, home accessories, and even functional bulletin boards to help keep you sane and organized. Since you can’t craft with wine bottles until you pop the cork, we’ve decided to include some clever wine cork crafts in our eBook as well. Even if you don’t drink wine, you can find bottle corks at almost any craft supply store…so there’s no excuse not to make these cute DIY wine cork crafts! If you’ve been saving up your corks for years, hoping you might find some fun uses for wine corks in the near future, you’re in luck. These Wine Cork Balls are a great way to not only create fun and unique home décor accents, but it’s a fun way to show off all the delicious wine you’ve sampled over the years! You could even record the type of wine and date you drank it on the cork so you have a fun (and decorative) reminder of all your favorite wines. Arrange these Wine Cork Balls in a large bowl in your living room or you could even hang them near a wet bar as a fun ceiling decoration that is sure to be a conversation piece! 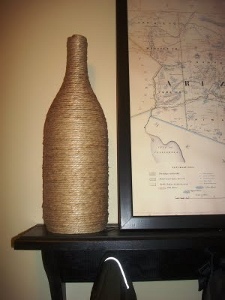 Wine bottle cork is also a great material to use for making bulletin boards. Arrange wine corks in a fun display to make your very own pin board that’s great for displaying your favorite photos, recipes, and maps to your favorite wineries. You can find instructions on how to make this project, as well as several other wine cork crafts, in our free eBook, 25 Cool Things to Do with Wine Bottles. As a little bonus section to 25 Cool Things to do With Wine Bottles, we included some fun wine bottle accessories that are perfect for attaching to a bottle of wine that you may be giving for a gift or bringing to a party. These bottle crafts are easy to make and can help add a little flourish to a nice bottle of your favorite vino. Great for a retirement party or a birthday celebration, this Better with Age Bottle Cozy is a cute and clever way to accessorize a bottle of wine. Bottle art projects like this are easy and quick to make and help add a personal touch to your gift. The great thing about this project is that you can customize it to suit any occasion. You could even make your own label for bottles of wine served at weddings and parties to make them fit the theme of your celebration. You could even create unique labels for empty wine bottles as well and put them on display in your home or use them as centerpieces for holidays and get-togethers. If you’re giving wine as a gift, it is probably a good idea to also include a stopper in case the receiver doesn’t have one. And there’s no need to go out and buy one, you can make your very own with the Steampunk Style Wine Stopper tutorial, available for free in our eBook, 25 Cool Things to Do with Wine Bottles. 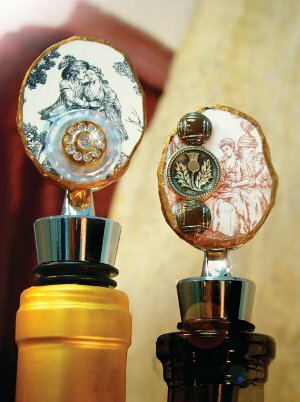 This wine stopper makes a great wedding and hostess gift, and is a great way to use up leftover supplies in your craft stash. You can find these projects and many other ideas for wine bottles, corks, and more in our free eBook, 25 Cool Things to Do with Wine Bottles. As you can see from these projects, there are tons of uses for wine bottles that are great for decorating, giving, organizing, and more…and you can find all these great ideas and tutorials by downloading this free eBook today. Want to take your eBook on the go? No problem! You can easily print out your very own copy or download it directly to your iPad, smart phone, computer, laptop, or other mobile device. Save it, send it to a friend, or share it with your book club. As is the case with wine, crafting is much more fun when enjoyed with friends…so download your free copy of 25 Cool Things to Do with Wine Bottles, grab your besties, pour yourselves a glass, and ponder all the fun projects you can make with the bottle once it's empty! Filled with lots of wine bottle craft ideas, 25 Cool Things to Do with Wine Bottles is a great go-to guide for using up all those empty glass bottles and unused corks. From creative garden accessories to fun ways to help you organize and decorate your home, these wine bottle crafts are great for anyone who’s looking for ways to craft their way through the recycle bin! 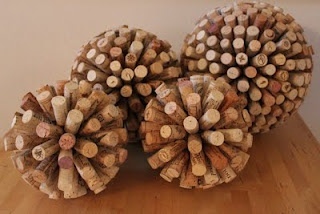 We have many left over wine bottles and I love the idea of recycling them into a great craft! Looking forward to trying these out. I love all your free E books. But I was printing out way too much, even when I just printed the pages I wanted. Then a friend showed me I could download the books onto my iPad in the iBooks app. Oh gosh what a great idea! I can make what I want and then delete the patterns and no tree died to do it! Thank you! I just met someone who melts wine bottles down flat & uses them for either Business Card Holders, Cracker & Cheese Dishes, or drills a hole near top of neck & uses it as an incense stick burner! Really cool -so I wanted to share this with all you crafters. I take a wine bottle (green at Christmas) and put a tiny string of battery-operated Christmas lights inside. Then I trim around the neck with greens etc. They look cute in the guest bathroom and around the house. I love crafting, but I hate when my final product looks like, well, a craft. Another thing I love? Wine! I had no idea how many adorable things there were to make out of a bottle Id typically recycle. My favorites were the Snowball Winter Wine Bottle Vases, and the Hemp Wrapped Wine Bottle. Theyre both so fun, so easy to make and while the first is mainly seasonal, they both look like decorations I would walk into a store and immediately buy. My only question is, how much did some of these cost? Not that prices would stay consistent everywhere, but giving crafters an idea of how much money we should be spending on this would be great! This would also be an easy way to know what crafts fit the budget. Wyoming allows citizens to make up to 400 gallons of wine, beer, ale, etc. per year strictly for household consumption. Mom made her 400 gallons per year, mostly in wine that came welcome at big family gatherings. I inherited her estate. With it came hundreds of wine bottles. Thank you for all the incredible ideas for what to do with them! I bet you could package 3-5 wine bottles WITH the Epsom Salt and other stuff and sell them to "newbies" at Christmas time as a craft that could be done with the kids helping and simple enough! Good luck with all those bottles! Where can I order the cutter???? is there a answer back on where to get glass cutters? Try Micheal's or any arts and crafts type store. I love this book. I just need to know of a VERY CHEAP tool to purchase for cutting glass. Do a YouTube search for it. You only need lighter fluid, yarn/string, lighter, icy water. Be safe! Do yourself a favor, don't listen to this guy, No lighter fluid. Too dangerous. Go to amazon for the cutter, it's cheaper there. Then you score the bottle, don't confuse cutting with scoring. Nothing will cut the glass, you only score it with the cutter. Don't over score, just go around the bottle once. boil water, lightly pour on score line , make sure the bottle gets heated, then run under cold water, the bottle will stress and break on the score line. Sand edges and your done. Never use anything flammable, that's just Stupid ! I read on the Instructables.com site that you can cut wine bottles (or any glass bottles by tying a string soaked in acetone (some nail polish removers have it) around the bottle and lighting it on fire, then right after the flame goes out, dip it into a bucket of cold water. Be sure to do this outside in a safe place and do NOT hold the bottle vertically while the string burns! Hold with a pot holder or something non-flamable by the end furthest away from the flaming string, hold it horizontally so nothing on fire falls on your hands or feet and hold it directly over the bucket of water so that you are ready to drop it in (from not too far above) when the flame has burned out. I have not actually tried this yet, but it sounds like it would work. Hope this helps - cheaper than a glass cutter. i like craft books because there are different things that i would like to learn to do. like the book & some of it's ideas. I love the "cork board" & the cork balls. It had lots of cool, fairly simple projects; however, one particularly nice project was very detailed and I don't feel enough details were provided. A couple of items on the supply list were not defined and I had never heard of them, much less where to get them. Take masking tape and rip a piece off and apply it to a wine bottle. Repeat this overlapping the tape. When the wine bottle is covered with the ripped masking tape, use a dark stain and paint over it. Then rub off the stain and it will look like an antique bottle. This is a great site but focussed on the US. Quite a few projects require Mod Podge but I have no idea what that is, can you give us the name of a UK equivalent? Thanks. HELP !!!! i'm clicking on the (download your copy) & nothing happens. what am I doing wrong. 1. Right click on the link 2. Choose "Save Target As" 3. Browse to where you want to save 4. Save Adobe File. What do yothank you you so much . i have used yarn and glue it arould all the way to the top of a bottle i have takeing old colors and melted them down on my bottle do i well vent place and dont let child do it alone .i use a candle to melt my colors . i also glue all kinds of paper sticker or just differ kind things out of paper I on my bottle then Mod Podge it about 3 times. then i glued beads on my bottles and spray paint it gold after or can just let beads stay the color the are . so there lots thing s to do with bottles the dont have be trashed . my hubby spary paint the bottle for me and i was child when i the meting colors on my bottle . due to bad lungs now i cant be arould smoke or spary paint . have fun , ty u think?